In researching the possibility of applying for an NSF grant to buy a DNA sequencer for the UAF Core Facility, I did some looking into previously funded grants for DNA sequencers. 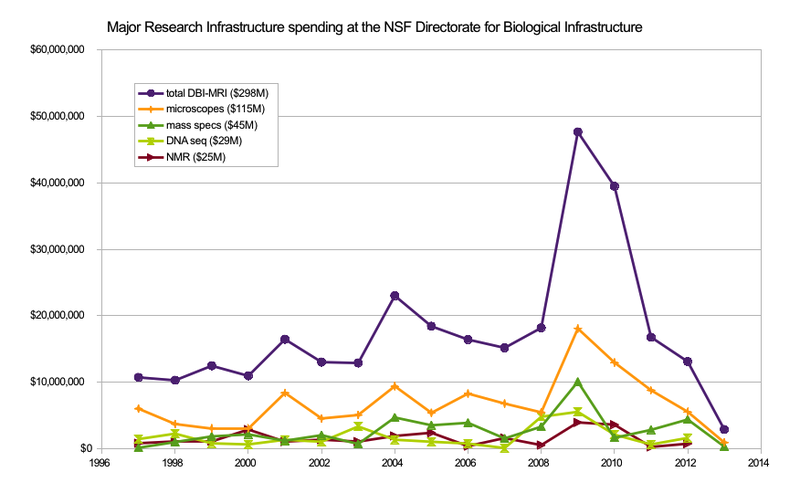 I found that of the $297 million dollars spent by the Directorate of Biological Infrastructure (DBI) on Major Research Infrastructure (MRI) grants over the past 15 years, only 10% was spent on DNA sequencing instrumentation. I am trying to decide whether this is surprising or not. What do you think? On one hand, DNA sequencing has completely revolutionized biology over the past 20 years, and technological innovation is still proceeding at a Moore’s Law-beating pace, which would seem to indicate that biologists should be requesting (and getting) new and better instruments all the time to keep up and make new discoveries. On the other hand, there are huge sequencing facilities like the Department of Energy Joint Genome Institute which keep entire rooms full of these instruments, and provide access to outside researchers via a proposal process. There is also a robust outsourcing market for DNA sequencing services, with a number of companies (and university research centers) providing extensive services including library prep, sequencing, and bioinformatic analysis. It might also be that researchers are getting money from sources other than the MRI program to acquire sequencing machines. 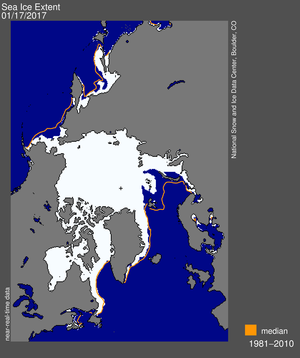 If you have insight on what other programs are funding these instruments please comment below. So is it better for biologists to have access to a combination of central (e.g. JGI) and commercial DNA sequencing centers, rather than a DNA sequencer in every lab? Of the most recent DNA sequencers purchased through the MRI program, two of them were Ion Torrent’s Personal Genome Machines (and several were capillary sequencers!?). These sequencers are lower in cost (~$75 thousand each) than many of the big, industrial sized machines that have come before. Illumina is also marketing a ‘personal’ sequencer called the MiSeq (the one I’m interested in, ~$125 thousand), which is much smaller and easier to use than its flagship HiSeq machine. So is it time for every biologist to have a sequencer in their lab? I doubt it will happen any time soon, or even needs to. I think at this point a good balance is a sequencer in every facility/institute/campus. This setup would maximize usage of the instrument for local users, provide opportunities for training and classroom use, and allow users to walk down the hall for support rather than sending an email that may languish in some distant inbox for days. In the meantime, I noticed that a large fraction of the DBI-MRI budget is spent on microscopes, of all types (at least $115 million). Microscopes are, of course, of central importance to nearly every field of biology, especially including my own field, microbiology. Perhaps I should just ask for a fancy microscope and leave the sequencing to others for now?